Let logged in users pay for tickets in Events Manager Pro from their cryptocurrency wallet. This plugin extension is a payment gateway for Events Manager Pro. Events Manager is a free WordPress plugin that lets you manage event bookings in WordPress. Its Pro extension, available from https://eventsmanagerpro.com/, allows for interconnection with payment gateways. This payment gateway bridges Events Manager Pro and Bitcoin and Altcoin Wallets, so that your logged in users can pay for event bookings from the cryptocurrency balances that they maintain on your site. Install, activate and configure the Bitcoin and Altcoin Wallets WordPress plugin, Events Manager, and Events Manager Pro. Install and activate this extension which you can download from here if you are a registered dashed-slug member. From the left-hand side admin menu, go to Events → Payment Gateways → Bitcoin and Altcoin Wallets → Settings. Select an admin account that will receive cryptocurrency payments and click on Save Changes. Click on the Back to Gateways link at the top of the page, or navigate again to Events → Payment Gateways. Under the Bitcoin and Altcoin Wallets row, click on Activate. You can now check that the booking extension works as expected in the front-end. After registering at dashed-slug.net you will have received an activation code in your e-mail. This code is also available at the dashed-slug.net sidebar once you login. Please paste your activation code in the provided input field. Finally, click Save changes. Congratulations, you should now be receiving updates for all the premium dashed-slug plugins. how do I set prices? You don’t. Cryptocurrency prices are often more volatile than those of fiat currencies. The products in your e-shop are priced at the base currency that you have selected in the Events Manager PRO settings, as usual. This will be a fiat currency. The amount that the end user pays is the order total, converted based on current exchange rates, plus any transfer fee that you have set up in the coin adapter settings. Visit the Bitcoin and Altcoin Wallets admin menu to set coin adapter settings for each cryptocurrency. Price conversions are done by querying the fixer API for fiat-to Bitcoin conversions, and another API of your choice for BTC-to-altcoins conversions. You can choose between the Bittrex, Poloniex, or Novaexchange APIs to pull exchange rates. Requests to these APIs are cached for a configurable number of minutes. See Wallets → Exchange rates. how does the user pay? When a logged in user views an event, they have the option to book tickets near the bottom of the page. There is a dropdown titled Pay With. 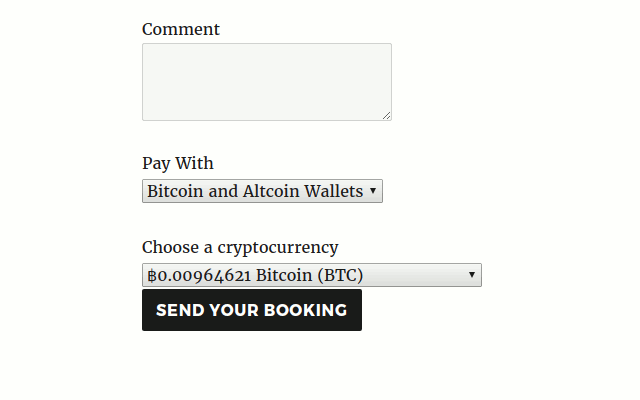 Once they select to pay with Bitcoin and Altcoin Wallets, a second dropdown appears that lets them choose a cryptocurrency with which to pay. All cryptocurrencies that you have enabled on your site via coin adapters will appear here, as long as their API backends can be contacted. Next to each option, the amount to pay will be indicated. The user then simply clicks on the Send Your Booking button. Their booking will be set to Pending or Approved status, depending on your Event Manager settings (Events → Settings → Bookings → Approval Required?). After the order is completed, they will be able to see the transaction in the transactions UI that corresponds to the [wallets_transactions] shortcode (see Wallet shortcodes for more). The site administrator can see a record of the transaction in Events → Bookings → Transactions. At the moment the underlying wallets API does not allow transactions to be reversed or cancelled. This might be available in the future. For this reason, the gateway does not currently allow users to cancel their bookings. An administrator can delete a booking, but they would have to take manual steps to refund the user. This is a known issue that will be remedied in the future. You must be a premium dashed-slug member to gain access to this plugin. Paid membership gives you access to all the current and future premium plugins on the site, and to updates of those plugins. For any issues, inquiries, suggestions, and general feedback regarding this payment gateway, visit the support area. For support regarding the parent plugin, Bitcoin and Altcoin Wallets, please use the support forums on WordPress.org. Updated on 2018-10-30T17:43:12+00:00, by alexg.